It’s been an interesting day in my Facebook feed. So many of the homeschoolers who were posting glorious photos yesterday are finding Day Two is not quite so glowing. I can’t say I’m experiencing this personally because Day One for us consisted of having Second Breakfast at the park with friends, and being on time to our orthodontist appointment. Obviously, we’re slated for trouble tomorrow. Okay, so regardless of whether a meltdown hits my home tomorrow or not, I think I can state the obvious and say that Meltdowns Happen. They just do. Every child has a day where they think they can’t take it and they begin to wail and scream or do whatever it is they can do to respond inappropriately to the situation. And oh how often we are tempted to be annoyed by this because clearly when they are sobbing they are not doing math or grammar or checking any of the other boxes we are interested in having them check. We might as well start the year off by getting one thing clear: education is not and never has been about getting through curriculum. It’s not (primarily) about knowing more, nor doing more. It’s not about this project and that craft. Oh, sure, all of these things can be tools of education (though I admit the word “project” frightens me just a bit — it sounds suspiciously like me doing work while they watch — also not education, in case you were wondering). But these things are tools. They are even content. But they are not its substance. Education, you see, is about becoming. Ancient men like Plato and Aristotle called it virtue. Augustine (and CS Lewis after him) called it ordered affections. 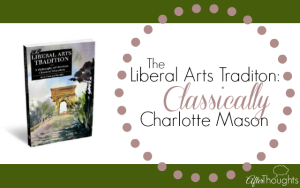 Charlotte Mason called it character. David Hicks called it style (among other things). Most recently, it looks like James K.A. Smith is calling it worship. Call it what you want to call it, inner change is the name of the game. Growing up. Getting ordered inside the soul. Maturing. Becoming what we are created to be. And all this sounds so great until someone turns on the water works and starts howling about math. Here’s the deal: if education is about filling young minds full of facts, then a meltdown really is getting in the way. But if education is about formation–about becoming something other than we are–then meltdowns are an opportunity. But still, I’m serious. And therefore I repeat: meltdowns are an opportunity. 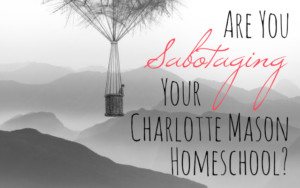 As are bad attitudes, sibling squabbles, and all the rest of the rot that sometimes dominates our daily lives as homeschool mommies, especially if you have more than one student. These things are a chance to get out those tools and start sculpting. Some children need to let go of their perfection. Others need to learn to work harder. Some need to be patient while they think and take time to figure it out. Others need to learn to ask for help when they’re stuck. Some need to learn to love their neighbor even when “neighbor” includes “my sister.” Others need to learn to be grateful for all the blessings God has given. Every meltdown, every frowny face … it’s all a chance to peek into the heart and see where the child stands. Hypothetically, it is possible that there has been a time or two around here that I was standing on the other side of the room throwing an internal tantrum of mine own. This is the part where we need to pray for wisdom. Insight into what the root issue is. A path to follow in reforming that sadly misprioritized soul. You see, it’s all part of the curriculum. Every single time our days bump up against hard things, we find hidden in the pile the chance to help a child change his faults, to fight the inner beast we all have. To say no to being selfish, to being obstinate, to whatever it is that tempts him. Do we want meltdowns to stop? But there are ways of stopping them which corrupt. If we pay the child, for example. If we bribe him. If we appeal to his pride. But if we have repentance and then a plan of action for the formation of new habits well, now we’re talking. He’s practically a new man already. About three weeks ago I had to start making a child say it over. Context is everything, right? So for some children the right way would be “respectfully” while for others it’d be “audibly” and for others it’d be in a “not-so-bossy” way. My point here is that the habit path, this road less taken, it’s really working, but it’s also really work. Do it again. Get it right. We’re not mad at you, but we are trying to help you. So, next time we face a meltdown, might I suggest we pick the little puddle up off the ground and think in terms of habits? Childhood is the best place for do-overs because adulthood isn’t quite so forgiving. Let’s do it over. Let’s do it right. Let me help you. We’ll build a habit. Then you’ll be truly free. I may, or may not, have done a key word search for “homeschool mom encouragement” and fortuitously landed on your beautifully written post. Thank you!! This was just exactly what I needed. 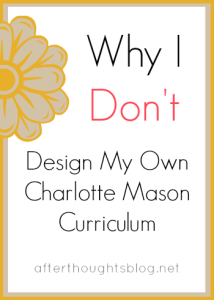 When the baby is sleeping and the toddler is howling (threatening to wake up the baby) and one or two other students are not being studious, it is easy to feel completely ineffective and unsuccessful in this journey….education…..formation….meltdowns…..opportunities! Keep up the good work. Thanks for including the link to this post this week, Brandy! My 5 year old is prone to meltdowns, and quite honestly, I am not so great at keeping my cool, either. I appreciate your reframing of the situation to an opportunity to do it over, say it over, get some help, and work together…all without getting angry with my child. He and I are both highly sensitive personalities, so overwhelm happens fast and frequently. I need all the reminders I can get to slow down, take a deep breath, and reframe things to help us both deal with meltdown in a more positive way! Thanks for your authenticity. Meltdowns here too. I wish to print an paste it all around my house. I need to read this all the time. Yes. We had tears this morning. Yes. I threw an internal mummy tantrum that may have seeped out a little onto my face, and may or may not have crushed my little ones already fragile heart ?. Thank you for your timely reminder about what I’m really doing this for. A great encouragement. You have no idea how this post has blessed me. I have four children – two on the autism spectrum, one with ADHD and a one-year-old…this is meltdown central some days!!! We are bringing home our oldest – most severe autism – to homeschool in the fall and plan to stair-step the rest home over the next couple of years. Our primary goal next year is therapy; I keep feeling guilty over the amount of academics I’d like to do but your post so pleasantly reminded me…LIFE is the academic schedule. It’s so classically CM ;). I just love what you said about education being about becoming. Thank you so much for this reminder. Clicked over here from today’s post. 🙂 “But if education is about formation–about becoming something other than we are–then meltdowns are an opportunity.” Love it, love it, love it. Loved this — because most often I am just wanting to make it go away as quickly as possible. I need the reminder. Excellent. I really need to hear this today! God bless. Love, love, love this! 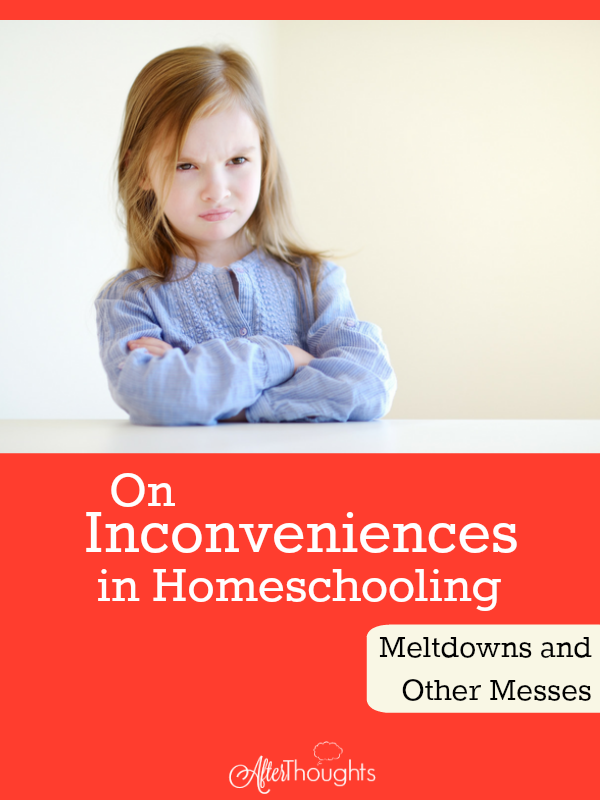 I have struggled and struggled with my daughter’s meltdowns during school over the years. It’s so refreshing and encouraging to remember that it doesn’t just happen in our homeschool and to remember the “opportunity” behind it. I do a much better job handling meltdowns in other contexts, outside of “school” (like at the store, or park, or even at bedtime) but this one is still really, really tough for me! I’m going to pin this, print this, memorize it if I have to! 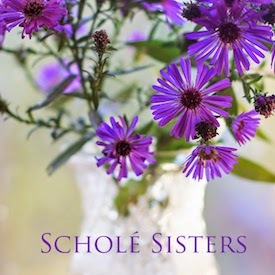 A great word for this homeschooling mama! Thanks so much for sharing! Love your blog, hopped over here from amongst lovely things. This all makes me want to cry because the only ones crying at my house are my children too young to have any school to cry about. I hate that I have to say no to them so much. 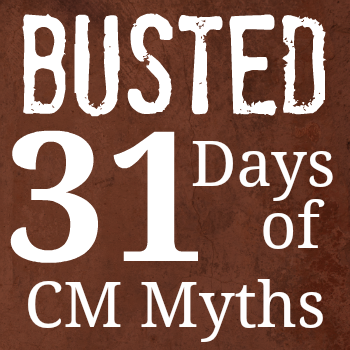 I’m ready for Day 3– But glad I read this on Day 2!! Thanks! This is a wonderful perspective. I’m really struggling with my daughter’s meltdowns so I am definitely going to remember this during the days ahead. Absolutely loved this post so much. Thank you for such wisdom. I myself have been known to tanty so my boy learned it off me :/ encouraging advice. Tara. FABULOUS, must-read post! I will be sharing tonight on HEDUA’s FB page (facebook.com/heduaonline). Hoping to get a good discussion going–help the newbies not feel so bad and help veterans remember. 🙂 I think homeschool parents should read this monthly. 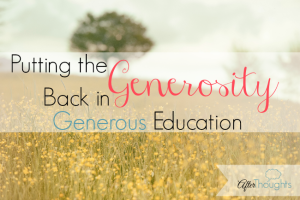 This post is a keeper, Brandy — thanks for being transparent, teachable and always inspiring! Brandy, this is such a great reminder. Meltdowns happen often in our house of dramatic young ladies. I am one of those who melts down at times. This is encouraging as we go on to day 4 of school tomorrow. Thank you! We had some wailing and squealing today and thanks to you I remembered that these things just happen. Deep breath, reassess, flare prayer, and keep moving. I’m not sure I remembered to use it as an opportunity, but it’s a step in the right direction. Amen, right off the bat. This is a mighty post, Brandy, thanks! What a truly lovely encouragement. Brandy! This is seriously amazing. Thank you! Brandy, posts like this (and more) are exactly why I tell fellow homeschooling Mamas that if they’re going to spend time reading blogs, yours should be one of them. Well done!! Judging from the sheer number of comments, I think you can tell you struck a chord! Thank you for the reminder of truth this morning!! Perhaps it’s because Day Two really *is* harder than Day One? Now, *that* is a great page! I look forward to reading your other links! Thank you Brandy. It is so good to know it is not just my house that this happens in. Keeping my cool in the midst of these meltdown moments has been a real struggle for me and it’s good to have it reinforced that I need to continue to pray for self-control for myself, so that I can help my children grow in self-control as well. 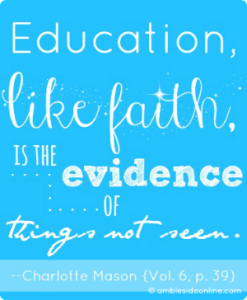 This is a perfect reminder, Brandy, of what this journey of homeschooling using a CM philosophy is all about. Thank you, as always, for a remarkable post. Just so you know, major meltdowns happen when you have only one student as well. And they’re just as bad. Sigh. Thanks for this Brandy. I’ve had 2 children sick over the past 2 weeks & was feeling frustrated over what wasn’t happening (and the extra interruptions of drs appointments etc) but it just created another set of circumstances for the ‘formation’ you were talking about – in me, as well as the rest of the crew; a bit of consideration, kindness, stepping up to do the household work the sick ones couldn’t do. So true about childhood being the best time to learn all this! Amen. Funny, Jon says the same thing about public school. Those first few weeks are about molding character, building respect, establishing routines, and training habits. Hard work (aka curriculum) just becomes a tool for accomplishing that. Beautiful! We are having a day of triumph followed by a day of meltdown over the same exact math for a couple weeks now, and I’m taking lots of deep breaths myself so I don’t devolve into my own meltdown. Interestingly, I’ve figured out it’s not actually the math; it’s “arguing with your mother” in various manifestations. So we’re doing the “try that again” routine a lot! Hi Brandy, as everyone else has said (and although it’s been 4 years), I really appreciate this post and your honesty. 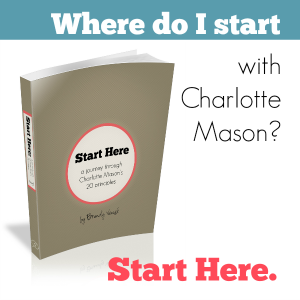 I’ve been reading your blog, doing random searches here and there as thoughts arise, and storing away much of what you have shared as I prepare to homeschool this fall. 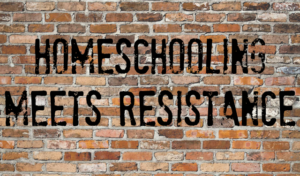 Many of your ideas and much of your advice has helped me to narrow things down and have a clearer vision of what I want our homeschool to be. Your (after)thoughts are a blessing! Thank you!